It is now the fourth Langeland has been selected by EFSA for hosting a European Champions- hip. Whilst the Langeland Belt and beaches on the East side of the island have regular visitors from Germany and Denmark, it is always an extraordinary privilege to host an event of such international class. Langeland is one of the Islands of the Fyn region in Denmark. Being surrounded by the calmer climate of the Baltic Sea tourism plays a huge role. Apart from fishing there are plenty of opportunities to go sailing, hiking and bicycling. Ferries connect the Fyn islands with the rest of Denmark but also Germany and Sweden. Sight seeing is concentrated on the island around Bagenkop in the South. Humble with the ancient grave of King Humble, Rudkøbing and Spodsbjerg in the middle up to Lohals in the North. The unusual lengthy shape gave the island its name (Langeland meaning the ‘long land’). Flatfish will be the target for this competition. In the waters around Langeland late autumn is the most prolific time of the year for this kind of fishing. 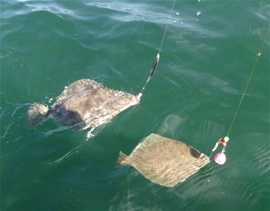 The main two species of flatfish caught will be flounder and dab. However, plaice and turbot might make an appearance too. We are very proud for EFSA Germany for being selected as the hosts for this year’s species championship and wish all competitors a successful and enjoyable time! Only flatfish score. 1 (one) point per flatfish caught unless length 40cm or above. Flatfish over 40cm or above score 10 points. current, and thus giving the optimal drift for catching fish. We will fish from fishing boats with around 12 anglers/boat. artificial ones as per EFSA rules. Fishing license is obligatory and can be obtained from Angelcentrum Langeland. Underhand casting allowed with weights, bait and hooks outside the boat at all times. Fishing is catch- and release, scorecards will be given to all participants. Fishing cap tains on every boat to check bigger fish. If you want to keep the fish, you have to cut off the tail immediately (have to be above the legal minimum sizes for Denmark at the time). on points the angler with the largest fish wins. If there is a draw still the higher number of fish will be taken into account. Only provided baits must be used. Open Pairs - EUR 10 per pair to be paid at registration Executive teams of 3 blind draw. Anglers above the age of 18 and below 65 require a fishing licence to fish in Danish waters. The costs are DKR 185 for a year or DKR 130 for a week. Anglers can obtain this from Angelcentrum Langeland. This is not covered by the entry fee. Each competitor will receive a spool of Ande braided line (20lbs 300m). To fish for the Line class pin the braided line provided has to be used. Fishing captains/boat steward will check every morning if the line is being used and mark a sheet accordingly. The winners of the Line class part of the competition will be awarded the prestigious Line class pins. Annual member Life member Lady Senior (65 and over) Junior (under 18) Juniors and Seniors; age at start of event to count. All entry forms must be sent to your own Section Secretary by the date specified by your Section. Your Section Secretary is responsible for forwarding all entry forms and cleared payments prior to close of entries which are due prior to: 30 March 2017. The sender is responsible for all transmission charges imposed by the sending and receiving banks and this must be allowed for in any funds sent. Re- ceipt of payments and entries received will be acknowledged to the relevant Section Secretary within one month of close of entries. 6.) I agree to be bound by the rules of the event and will not hold the Organizers or Federation respon- sible for any loss, damage or accident caused to myself, my companions or property during the event program. 09.00 - 15.00 Fishing 6 hours from first “lines down”.